Capable of issuing more than 140 single-sided color cards per hour, it is ideal for card issuance in medium and large quantities. Avansia is exceptionnaly fast with an output of more than 140 single-sided color cards per hour. Thanks to the high capacity feed tray and output tray (250 cards each) - and high capacity consumables (500 prints per roll), you can print your card runs with no interruptions. 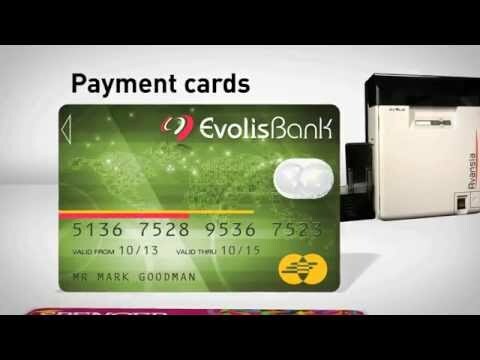 Designed to issue cards intensively, Avansia is robust and reliable. Its 3-year standard warranty and life time warranty on the print head guarantee your long-term investment. Avansia can operate in critical environments (dust, heat...) thanks to its airtight structure. The Avansia Retransfer technology can print on all types of cards (PVC, PET, polycarbonate, ABS), including uneven card surfaces, such as smart contact and contactless cards. To meet your specific needs, Avansia can be configured for all types of data encoding options: magnetic stripe, contact and contactless smart cards. These factory-configured encoding options can be combined. Avansia can be easily locked by removing the RFID electronic key. This quite simply prevents any attempt to use the printer. A mecanical key lock, available as an option, prevents access to consumables. Moreover, Avansia comes with a security slot (Kensington® type). How does retransfer technology work? The printed film is then fused to the card using a thermal bonding process for flawless results. The built-in flattener applies pressure on the card, thus ensuring a perfectly flat surface. To maximize the quality and durability of printed cards, the lifespan of the print head and the overall printer reliability, use Evolis High Trust® ribbons. Incl. Evolis Elyctis Dual (IDENTIV chipset) encoder, smart contact station, antenna bracket, daughter board, cables and mounting kit. To be installed by an ERC (Evolis Repair Center) partner.